So expect that your search rankings are going to take a BIG hit if you’re a publisher whose content doesn’t respond seamlessly to the platform your reader is using, and if you’re currently delivering your content to mobile devices with one pants down. Well, maybe it’s not yet too late to prepare. If you find yourself scrambling to be mobile-friendly and can’t decide between a responsive design or dedicated mobile, it’d help to weigh the pros and cons of each before coming up with a decision. 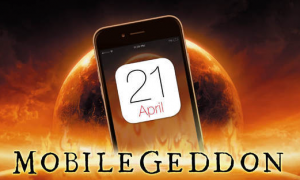 You can also read Google’s mobile guidelines and use Google’s mobile usability reports and the mobile friendly testing tool to prepare for this mobilegeddon. You see, the world has already gone mobile. You probably knew that already. But not all publishers see this coming so quickly. Originally posted on Digiday, below is an article written by Ricardo Bilton, illustrating this premise and how publishers are getting ready for this ‘mobile-friendly’ rankings. Becoming mobile responsive is no longer a choice in delivering your content online, it’s now a requirement. If you hope to survive this algorithm change, it’s crucial to verify that your app is optimized and your site is mobile friendly in accordance with Google’s standards if you hope to survive this algorithm change. Google’s “mobilegeddon” is coming, and not all publishers are going to be prepared. Google said in February that it plans to factor in “mobile friendliness” into its mobile search rankings. The tweak, the first iteration of which hits April 21, means that publishers with mobile-unfriendly sites — those with small text or elements that are too close together, for example — risk losing their top placement in Google’s search results on mobile devices. Top publishers, for the most part, appear prepared for the change. Out of the U.S. publishers in comScore’s top-100 rankings, the vast majority of them — including About.com, The New York Times and The Wall Street Journal, pass Google’s mobile-friendly test. There are, however, some exceptions. One of the more noteworthy examples, Mail Online, the world’s most popular English-language newspaper, which is already well-known for bucking trends by not optimizing its homepage for mobile screens, doesn’t get the Google seal of approval for its homepage. Ditto for Weather.com, which Google’s tool says features content that’s wider than the screen and links that are too close together. For publishers that run afoul of Google’s criteria, the prognosis is potentially grim. One saving grace for the Mail Online: While the site hasn’t tweaked its homepage for mobile, it has tweaked its article pages. This could prevent the site from being affected too adversely, considering that Google’s upcoming changes work on a page level rather than a domain level. Unlike Mail Online’s home page, its article page does pass Google’s mobile-friendly test. There’s a strong business case for Google to go through the trouble of potentially upsetting the many sites that rely on it. Last year Google’s Web spam lead Matt Cutts said he “wouldn’t be surprised” if Google’s mobile traffic outpaced that of desktop in 2014. Because Google is incentivized to create the best experiences for its users, it’s also incentivized to only link out to sites that also offer good user experiences, particularly when it comes to spam and security. The stakes are even higher with mobile, where users are more sensitive to unhelpful search results. Publishers should be worried, if history is any indication. Previous Google algorithm changes, particularly 2011’s Panda and 2012’s Penguin, were disastrous for sites that Google thought were “low quality” or those that relied on black-hat SEO techniques. Content-farm company Demand Media, for example, attributed a $6.4 million loss in 2012 to Google’s Panda change. Ebay and Metafilter have also been burned by tweaks to Google’s algorithms. While it’s too early to say exactly how badly publishers will be affected by Google’s changes, most signs point to a fairly significant shift in terms of how search rankings appear on mobile devices, according to Shahzad Abbas, digital media vp at Define Media Group. Read full article on Digiday, here. Trusted by many content creators, Realview has the tools and expertise to support a well-planned content strategy and help you stand out in Google organic search. 14 Common Mistakes Made When Going Digital	Should I Optimise My Flipbook For Smartphones?